Also known as Cosmoclimatology theory. Would the fact that water molecules are polar and are thus attracted / repelled by electrostatic charges be relevant here? I remember seeing water pouring from a hose being deflected by a charged plastic rod. Now imagine that on a global scale! That’s nothing to do with water molecules being polar. It’s due to having electrons stripped away by being passed out of the hose’s nozzle, generating a static charge. 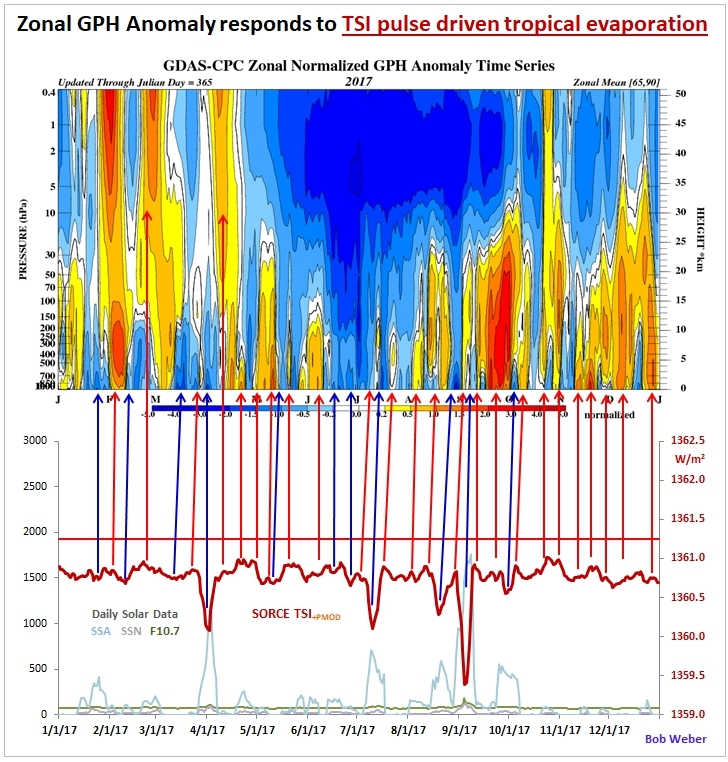 It sounds possible but it is equally possible that the increase in ionisation is just a coincidental factor with the real cause of global cloudiness changes being, as per my suggestion, solar influences leading to changes in the zonality / meridionality of jet stream tracks by affecting the gradient of tropopause height between equator and poles. How should we choose between the two possibilities ? I think you can move any dielectric matter (like small pieces of paper) with a charged plastic rod. It does not need any ionisation. Nevertheless, the capability of ions to serve as condensation nuclei is used in various technical instruments, e.g. cloud chamber. Could this also be the reason for the increase in noctilucent clouds? There has been a dramatic increase in the appearance of these clouds over the last 15 years. but wait! the IPCC and the climate experts (sic) like Mann said over and over that the sun only has a minor impact on climate. So then, do we log this as ‘weather’ rather than ‘climate’? Well, he would say that, wouldn’t he? If he said anything counter to that he’d be finished. The problem is that the highest increase in ionization is observed in high latitudes. In these latitudes, a height of 10 to 20 km is the lower stratosphere, not the troposphere. In my opinion, the increased ionization of the upper troposphere and lower stratosphere increases the amount of thunderstorms and the escape of water vapor into the stratosphere. The local increase in temperature in the lower stratosphere is responsible for the increase of water vapor in the mesosphere. Through these “holes” the water vapor escapes into the stratosphere. If we look at the anomalies of the geopotential height above the polar circle, we will understand that the water vapor escapes into the stratosphere above the 65th parallel. So it will continue during the solar minimum. Noctilucent clouds form when summertime wisps of water vapor rise to the top of the atmosphere and wrap themselves around specks of meteor smoke. Mesospheric winds assemble the resulting ice crystals into NLCs. In 2017 a heat wave in the mesosphere melted those crystals, causing a brief “noctilucent blackout.” Could something similar, but opposite, be happening now? Perhaps a cold spell in the mesosphere is extending the season. Another possibility is the solar cycle. Previous studies have shown that NLCs sometimes intensify during solar minimum. Solar minimum conditions are in effect now as the sun has been without spots for 30 of the past 31 days. Factors governing the strength and frequency of stratospheric ozone intrusions over the Pacific‐North American region are considered for their role in modulating tropospheric ozone on interannual timescales. 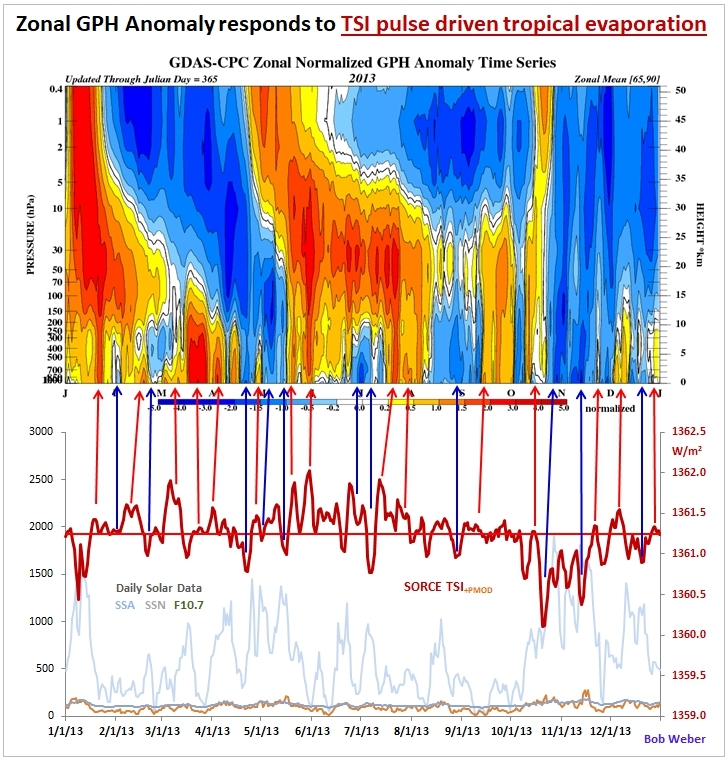 The strength of the association between two major modes of climate variability—the El Niño–Southern Oscillation (ENSO) and the Northern Annular Mode (NAM)—and the amount of ozone contained in stratospheric intrusions are tested in the context of two mechanisms that modulate stratosphere‐to‐troposphere transport (STT) of ozone: (StratVarO3) the winter season buildup of ozone abundances in the lowermost stratosphere (LMS) and (JetVar) Pacific jet and wave breaking variability during spring. In essence, StratVarO3 corresponds to variability in the amount of ozone per intrusion, while JetVar governs the frequency of intrusions. The resulting analysis, based on two different reanalysis products, suggests that StratVarO3 is more important than JetVar for driving interannual variations in STT of ozone over the Pacific‐North American region. In particular, the abundance of ozone in the LMS at the end of winter is shown to be a robust indicator of the amount of ozone that will be contained in stratospheric intrusions during the ensuing spring. Additionally, it is shown that the overall strength of the winter season stratospheric NAM is a useful predictor of ozone intrusion strength. 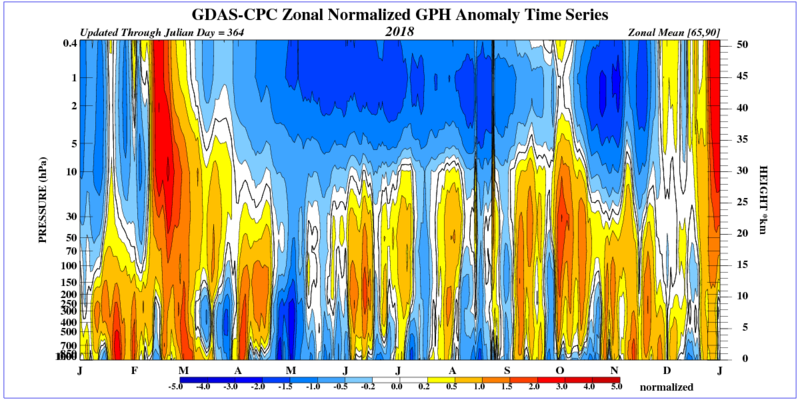 The results also suggest a nuanced relationship between the phase of ENSO and STT of ozone. 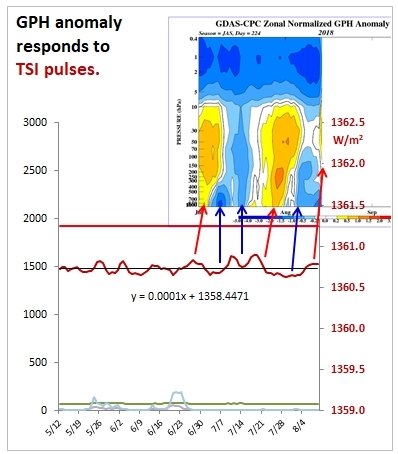 While ENSO‐related jet variability is associated with STT variability, it is wave breaking frequency rather than typical ENSO teleconnection patterns that is responsible for the ENSO‐STT relationship. An increase in ionization during the solar minimum will increase the stratospheric intrusion in medium latitudes. Stratospheric Intrusions are when stratospheric air dynamically decends into the troposphere and may reach the surface, bringing with it high concentrations of ozone which may be harmful to some people. Stratospheric Intrusions are identified by very low tropopause heights, low heights of the 2 potential vorticity unit (PVU) surface, very low relative and specific humidity concentrations, and high concentrations of ozone. Stratospheric Intrusions commonly follow strong cold fronts and can extend across multiple states. In satellite imagery, Stratospheric Intrusions are identified by very low moisture levels in the water vapor channels (6.2, 6.5, and 6.9 micron). Along with the dry air, Stratospheric Intrusions bring high amounts of ozone into the tropospheric column and possibly near the surface. This may be harmful to some people with breathing impairments. Stratospheric Intrusions are more common in the winter/spring months and are more frequent during La Nina periods. Frequent or sustained occurances of Stratospheric Intrusions may decrease the air quality enough to exceed EPA guidelines. IIRC, Piers Corbyn argues that there are far more charged particles than cosmic rays reaching Earth. In the period of low solar activity, there are actually more clouds above the oceans. The reason for this is the lazy jetstream, which forms the upper lows above the oceans. That is why there are heat waves on the continents. However, the surface of the oceans is cooled. As a result, the amount of water vapor in the atmosphere is reduced, which has a similar effect to the strong La Niña. ren – yes, it may seem odd to some people that low solar activity can lead to heatwaves, but your jet stream mechanism shows how that can happen. A good example is the lack of strong tropical storms in the Atlantic. 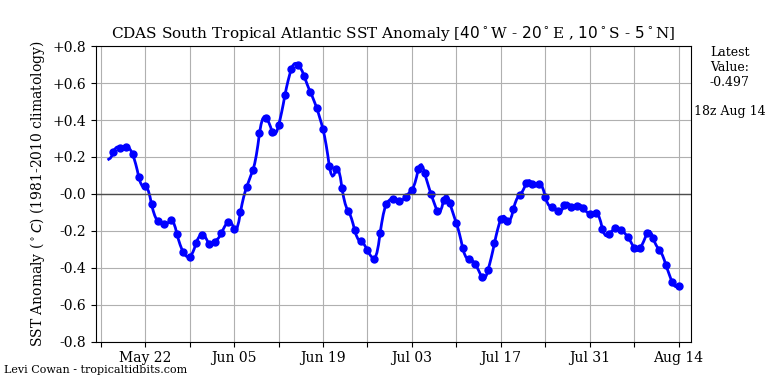 What’s more, the temperature of the southern tropical Atlantic drops. Please see the size of the cloud cover above the southern eastern Pacific. I agree somewhat S. Wilde that this a coincidental effect related to solar activity level. The real action is at the topics, controlled by TSI. The water vapor plumes at high latitude are driven there from the tropics. The amount of water vapor over time is related to the solar cycle(s). The heat waves result from dry air, high insolation, high UV index, when tropical evaporation is low, as happens during solar minimum years, and prolonged periods of low solar activity. Hence the droughts and heat waves of the 1920s & 30s. Hence the heat waves and drought this year in the US, the UK, and elsewhere. The land heat this year is similar to 1976, the end of low solar activity in SC20. The big contradictory evidence for Shaviv and Svensmark is the larger amount of cloud cover during and following the high solar activity cycles 21 & 22, when cosmic rays were low. To me cosmoclimatology is not doing much of anything compared to other solar influences. Still no conditions for the formation of hurricanes in the Atlantic. There has been a jump in the speed of the solar wind, which will increase the speed of the jet stream over the oceans. In essence, StratVarO3 corresponds to variability in the amount of ozone per intrusion, while JetVar governs the frequency of intrusions. The resulting analysis, based on two different reanalysis products, suggests that StratVarO3 is more important than JetVar for driving interannual variations in STT of ozone over the Pacific‐North American region. In particular, the abundance of ozone in the LMS at the end of winter is shown to be a robust indicator of the amount of ozone that will be contained in stratospheric intrusions during the ensuing spring. Stratospheric Intrusions are more common in the winter/spring months and are more frequent during La Nina periods. Currently, there are stratospheric intrusions in Australia. Visible excess of ozone. 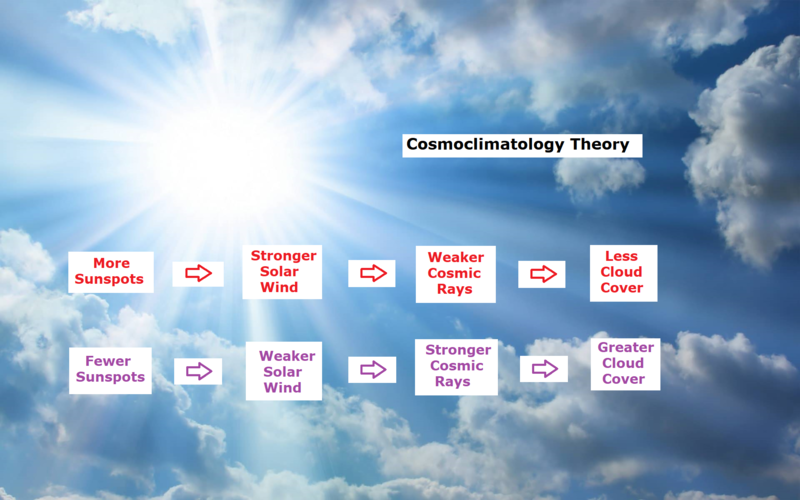 Galactic Cosmic Rays weather theory is BadPhysics. The flow of Galactic Comic Rays (#GCR) into the solar system is modulated by the strength of the Sun’s magnetic field – the 11year cycle. For GCR to be the agents of Earth weather (temperature) changes (eg via modulation of cloud formation by GCR) therefore REQUIRES the main Earth weather cycle to be the solar 11 year. However THIS IS NOT OBSERVED. The hugely dominant world temperature data signal is 22 years – the MAGNETIC CYCLE OF THE SUN. This is because the magnetic cycle of the Sun controls the connectivity of Solar wind particles from the Sun to the Earth which drives Earth weather. GCR flux (a mix of positive and negative particles from different directions) to Sun and Earth is not affected by the direction of the Sun’s field only the size of it. The total energy of Solar wind particle flux is 300x the total GCR energy flux.Therefore we say the GCR-Earth weather theory (whatever the importance of GCR in interstellar activity) is 99.7% wrong. Hi ren. Your points about ozone are well taken. Thank you for posting the GPH images. Now we have smoking gun evidence that daily TSI drives daily weather. My point is the geoeffectiveness of cosmic rays is very questionable, considering the weather is responding to variable TSI. The cooling attributed to CRs is owed to low TSI. Please note in the previous image of 2013 the most active period was during the highest TSI months from May-July. 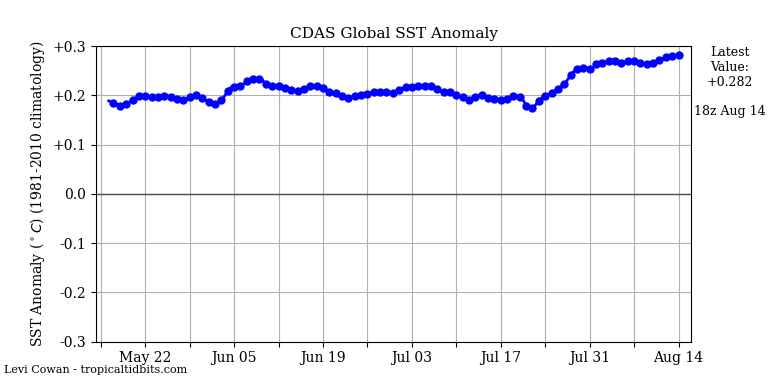 In the next image from last year the least active period was during the lowest TSI months, July-Sept, following two long-duration low points in May and June. However, the stream of secondary galactic radiation reaches the Earth’s surface (e.g., neutrons) and is focused by magnetic field lines in certain regions. During the polar night, GCR ionization is an additional source of energy in the lower stratosphere. Craig – re The total energy of Solar wind particle flux is 300x the total GCR energy flux. And solar wind / GCR is a sort of inverse relationship – more SW less GCR and vice versa. But maybe it doesn’t matter much with that 300:1 ratio. GCR have a more significant role in the climate then TSI.